We finally found an area of New Zealand that we could rave about for cyclo-touring, and that was the interior of the central region of the South Island. Wanaka, Queenstown, and Te Anau were all unexpectedly pleasing to our eyes. Steep grades made for some very difficult riding, but we enjoyed the greater drama of the scenery, the near-absence of sand flies, and the often better weather of the non-coastal region. The traffic on the South Island was lower in volume and ferocity than that on the North Island, as we'd been assured, and it was at its best even farther south on the South Island. Mid-January didn't spare us from the torrential downpours or occasionally fierce winds, but we didn't envy the humidity that the North Island was experiencing at the same time. Discovering the pleasure of riding in this region explained why all 4 of the 4 New Zealand bike tours we'd been aware of were in the southern reaches of the South Island. I spoke with operators or participants of 2 of the 4 groups. One group was only looping around the southern half of the South Island and the other group was spending most of their time on the South Island. The second group's North Island riding was limited to several traffic-sheltered loops, with their bus being used to transport the riders and their bikes past the unpleasant, intervening traffic areas. It had taken us 10 weeks to find it in New Zealand, but at last we could enjoy some peaceful riding and the kind of days that sustain us in this lifestyle. Amazingly, coastal Invercargill with its 50,000 people was less intense that more inland Queenstown at a mere 9,000. I expected to be bowled over in our first city in 45 days, but Invercargill was like a stretched-out little South Island village with its 1 storey shops and houses defining most of the city. Much of the business district was like elsewhere on the island in looking like the last building boom was in the 1950's. Henry, who weighs about 2 1/2 lbs, is over 100 years old. 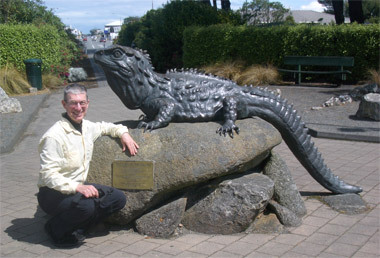 We had asked a number of Kiwi's along the way what we must see in Invercargill and nobody came up with much, including the folks that were from there. We had originally budgeted several layover days for the city but the consensus was that we wouldn't be doing much after we visited the i-Site for the following week's lodging reservations and stocked up at the first real supermarket for some time. "Henry," a tuatara at their free little museum was one of the highlights of our Invercargill visit and they are indeed proud of him. 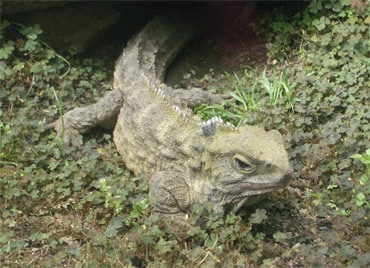 Bill snapped a photo of a stuffed tuatara at the Wellington museum, but Henry is alive, or so they say. We didn't see Henry flinch but he looked fresher than the stuffed one. At somewhere over 100 years old, he seemed to have mastered the art of getting by. Tuataras are notable in that their ancestors date back 225 million years--Gondwanaland fauna before the big continental break-up. Most other reptiles in their Order died out with the dinosaurs about 65 million years ago, but the tuatara branch managed to survive, but only in New Zealand. The size of Henry's relatives early in the dino era. And they do know how to just survive. When the temperature drops down in the 40'sF, tuataras can manage with taking only 1 breath an hour. In the winter, they only eat once every 3 or 4 months. In the summer, they'll eat a couple of times a week. And they are easy to please: if it moves and fits in their mouth, they'll eat it. With survival skills like that, it's amazing that they didn't take over the world. Oh, and just to underscore that they hark from a different time, those spines on Henry's back and his bronze ancestor are really feathers. It seemed that on the South Island we were never far from being in the wop-wops. Even when in Invercargill, one of the largest cities on the island, I felt a little remote. The volume of produce in the very welcome, big supermarket was high, but the freshness-factor was lacking. All of the 20 or so cauliflowers had wilted leaves bordering on rotting and the white fruit sported a faint rainbow of colors. In this apple-growing country, there was only 1 variety to choose from and it was hard to find undamaged specimens. The carrots didn't look much better than the apples and starting turning black the next morning even after being refrigerated over night. And we'd noticed in the last couple of weeks that our favorite brand of sliced bread was starting to have significant mold by the second day in our care. The conditions under which we kept the bread hadn't changed over the weeks and we suspected that instead it wasn't getting the best of care by the distributors in the journey around the island. Serious provisioning for 10 meals for 2 in the wop-wops. Our first night out of Invercargill into the Catlins coastal area along the Southern Scenic Route would throw us into serious wop-wop-land for 5 days and 4 nights. We'd be able to re-provision to some degree for night 4, but would need to carry all of our food for our first 10 meals for each of us, instead of the usual 3 meal stash. It took careful shopping and repacking to keep us in just enough food for the area as there would be no certainty of restaurants to fall back upon. When we headed down the west coast several weeks ago (with our photographed, huge chocolate stash), we knew we'd be able to buy food every day or 2, so we only stocked up on favorite items that wouldn't be available in the small stores. But this segment would be different--we couldn't count on much more than candy bars at the occasional tavern en route. 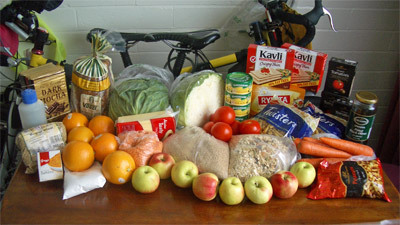 We estimated that we each loaded an extra 20 pounds in food onto our bikes--enough extra weight to be felt with every pedal stroke. The good news was that the burden would lighten appreciably with every meal. Another reminder of the remoteness of the Catlins area were the road surfaces. The main road through the Catlins was only sealed in the last 2 years and just in time, we discovered the alternate route Bill had planned to take was gravel much of the way. The official maps weren't forthcoming about gravel roads--a condition that can easily cut our speed to half or less and could increase our food demands. 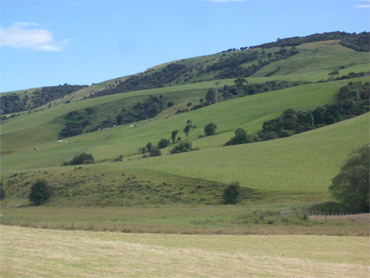 The pleasing but not spectacular look of the Catlins. The Catlins on the southeastern coast of the South Island is an area that we visited because so many Kiwi's got kind of dreamy-eyed when we asked if we should tour there. Everyone was universally enthusiastic about the area but we quickly wondered why. "Long on nice, short on spectacular" was Bill's summary of New Zealand and the Catlins. Again, it was lush and fresh but rolling hills speckled with sheep were hardly a suitable pay-off for a logistically difficult detour on a bike. To me it looked like the area south of Auckland on the North Island--an area I enjoyed--and I wondered if any of the South Islander's we had spoken with had even seen that segment of the North Island. Like much of New Zealand, the Catlins would be better seen from a car than by bike. The compressing effect of traveling at car speeds would enhance the experience, as there wasn't enough variety for the challenges faced by cyclists. It reminded me of biking in Central Germany last summer: the low volume of traffic made the biking quite pleasant, there just wasn't enough to see. We don't travel by bike because we are passionate cyclists but instead travel by bike for the closer look it gives us as tourists. But of course, there needs to be some substance there to be worth the considerable extra effort. 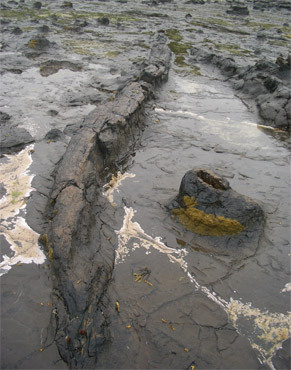 Petrified tree trunks & stumps at Curio Bay. Indeed, there were some things to see along the way in the Catlins, but many required side trips that were troublesome on bikes. 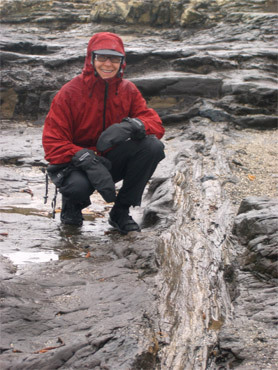 We took the extra day required to detour to the Jurassic-era petrified logs and stumps at the Curio Bay beach which were curious, but not remarkably different than petrified wood we'd held in our hands since childhood. 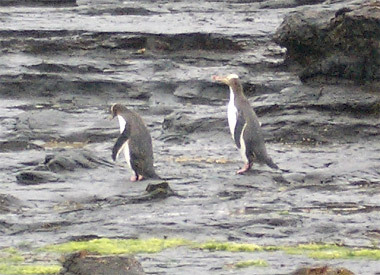 It was a treat to see a couple more of New Zealand's tiny blue penguins there, but once again, we couldn't get close enough to really appreciate them. A few days later we did another extra day detour on a gravel road from Kaka Point. It turned out to be a trying and tedious 25 mile round trip up and down a lot of hills, with more than half of it over severely wash-board-contoured road bed with piles of gravel. We endured the jarring road, the rain, the wind and darn-it-anyway, the sea lions that were supposed to be at Cannibal Bay weren't in that day. Once again, this was a case where seeing the area by bike was just too hard--too much effort for what we saw. For bike travelers to the Catlins, lodging is so scarce that it dictates what you can see and how. The long, rough day out to Cannibal Bay was made so by the dictates of lodging. And we had to pass-up a notable cave visible only at low tide, which was 6:30 pm, as there was no nearby lodging. Buses only go through the area once a day, so they weren't a sight seeing resource. And in addition to the aggravations, the routes through the Catlins were like most of the coastal roads in New Zealand in that we were rarely in sight of the ocean. The ever-shy little blue penguins on the run. By the time we "hit bottom" at the south end of the South Island and the Catlins, a definite pattern had emerged in our lodging. On the North Island, the lodging standard was pretty consistent, with us usually paying $70-80NZ ($50-56US) per night for 2, with it occasionally dipping lower. And what we got for the money was quite predictable. Almost every time we had a purpose-built motel room with a fully equipped kitchen. Some were spacious, others very 'efficient'; some were well-kept but quite dated, others were freshly remodeled; but with few exceptions, we were very pleased with them. Prices popped up on the South Island to the $90-130NZ ($63-91US) range, hovering around $110-120NZ ($77-84US), and the standard became more variable. And even on the South Island itself, there seemed to be a north-south split in the quality, with that on the southern end becoming increasingly unpredictable and more expensive. It was on the South Island that we spent more time 'camping out' in our rooms. More of the early evening hours were diverted to dealing with mold, strong odors, bugs, and making non-functioning things work. And despite the usual expectation of the i-Site tourist office folks in booking us with rooms with fully equipped kitchens, we increasingly had only an electrical teakettle. Our electric cook pot that we only used once on the North Island got quite a work out on the South Island. But what became our nightly roulette-wheel spin on accommodations did deliver some unexpected gems, and some by chance at the moment of arrival. In Queenstown, Bill had booked us at a luxury hotel that had slashed rates for a few slow days and the manager upgraded our room at check-in--it was bliss. In tiny Riverton just outside of Invercargill, we had fretted about what our $95NZ ($66US) room would be like. But it was half of a newly remodeled beach cottage duplex on a slope with a view. We basked in the natural light of the huge corner windows in the spacious living room of the 2 bedroom unit. It was the kind of cozy place we'd easily have stayed extra days had we not been caught on the conveyer belt of lodging reservations. And for $100NZ ($70US) our first night out of Invercargill delivered another unexpected gem. The booking mix-up could have left us with nothing, but since the cottage we had paid for was occupied, we were given the newly remodeled house for the same price. Those were the only 2 options in town, so we were lucky to have anything at all. The house which slept 6 was perched on one of the area's little hills so we had an almost 360° view of the surrounding pasture land. I love the brightness of many windows and being able to see far, with the content of the view being less important. These last 2 sweet deals had us shifting our beliefs a bit, as for both we were given instructions to pick-up the key at the village bar. Clearly they wouldn't be standard motel accommodations and we had feared for the worst, when oddly, they were some of our best finds. The more we delved into our New Zealand weather book and the more we directly experienced the weather, the more aghast we were. In one reading session Bill turned to say "It's hopeless." Indeed, New Zealand is perfectly positioned to get endlessly severe weather. It's their proximity to Antarctica, which is much colder than the Arctic, that sets them up. New Zealand and Argentina are just enough closer than everybody else in the Southern Hemisphere to the wicked westerly flow of air and resulting chilled ocean currents that swirl around the South Pole, the "circumpolar vortex," to get much harsher weather than other countries. We are now understanding that the land masses surrounding the North Pole help to buffer us in the US from the Arctic's direct winds, whereas there are no such land masses to soften the blasts coming off of the South Pole. Barb dressed for summer weather at Curio Bay. New Zealand's situation is made more complicated by nearby Australia and the warm ocean currents and warm air drifting down from the tropics past Australia. Whatever brews from the mixing of tropical and Australian air and winds slams into the low pressure systems spinning off of Antarctica while they are all near New Zealand. One evening the TV meteorologist described the situation as "a tangle of fronts over the country" as we counted 5 different frontal lines vying for dominance over tiny New Zealand. The result was that much of the South Island (where we were) was shivering under ice-cold Antarctic winds in the equivalent of the Northern Hemisphere's late July while parts of the North Island were blanketed by warm, highly humid, tropical air. The rest of the country was experiencing drizzle or rain. On another night the meteorologist explained that the winds the next day in the area would be from the northwest, with some occasional spells of winds from the southwest. Just that day we'd stopped for a break from riding in a headwind and before we took off again, it had reversed and we suddenly had a tailwind--it was amazing how fast the conditions could change. Almost every night that we saw the weather report on TV I was cringing to again see the Taupo area getting cloudy, wet weather. That was the closest forecast to the Tongariro Crossing area, the place where we were lucky to get a clear day to make the all-day scenic hike about the first of December. We knew we were lucky at the time, and subsequent forecasts underscored that. We talked to several tourists who, in January, were either unable to attempt The Crossing because of foul weather or made it but saw none of the stunning scenery because of the heavy cloud cover. One couple had trained just for The Crossing and were terribly frustrated in missing the opportunity because of foul weather. While in Invercargill at the end of January, I was stunned to see the average January rainfall and high temperatures in the newspaper for both Invercargill and Queenstown. We were under the impression that the area was having an unusually nasty summer, but the average high temperatures for both cities in mid to late summer were only in the mid 60's F (19-21°C). And the rainfall for both cities was running about half of the usual for the month, even though there were only 5 days to go. While we were in Invercargill, the daily highs hardly broke 60°, even under full sun. It hadn't been the summer weather we expected but it looked like our expectations were off the mark. And as we left Invercargill, our suspicions were heightened that perhaps the weather we'd been experiencing was indeed pretty normal. We were shocked that the early afternoon temperature that threatened to break 70° was sufficient to liquefy some of the asphalt on the road: our pedaling was accompanied by the sound of sticky bubbles bursting as our tires rolled over them. Our hostess for the day commented on the hot afternoon--an afternoon that peaked at 72°. We are happiest riding at that temperature or below, so weren't complaining, but not many call that "hot." Traveling in an English-speaking country gives us a chance to scrutinize our host country's culture in a way that we can't otherwise do. We can listen to the audio on the TV, not just guess at it from the video. And then there are all of the dialogues and over-heard conversations and written material from which to consolidate our opinions. In real estate, the voices of experience say "Location, location, location." The equivalent summary about the Kiwis would be "Nice, nice, nice." It's true, they are overall really nice people. And sooo calm. We began joking about exchanges between Kiwi's as being "Meditative Moments" as their brief dialogues between strangers could be so soothing and calm. Beats me where this unshakable calm comes from and how it keeps from getting contaminated by all the visitors to New Zealand. The calm seems oddly juxtaposed to their proclivity for creating adrenalin sports. And we wondered how they could be so efficient and organized with the complicated connections at the outdoor activity sites when they are so laid back. But somehow they've found that perfect balance between being accountable and responsive while maintaining what appears to be an inner and outward calm. 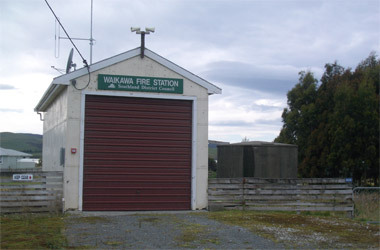 A wop-wops-sized fire station with a typical roof-water tank. We repeatedly noticed that the Kiwi's seemed to have a more literal relationship with the world. We were stunned at how few were concerned about the UV effects that they couldn't see. When I chatted with some Kiwi's about the sky-high daily UV indexes, they were mostly clueless about the significance--instead they monitored whether it was "a burning day" or not. But sunburns are the short-term issue, with cancer and eye damage being the long-term issue from the intense UV exposure, especially in New Zealand. I was curious about the convention in outlying areas of drinking rain water collected from roof tops, some of which we had been drinking at motels. A TV report left off with one of the residents demonstrating that the water was clear in color, so it must be OK. We wondered about all of those health agents that don't discolor water or cause turbidity and were disappointed to learn that there didn't seem to be any standards beyond visual inspection. When talking with a local South Island couple about the sand flies, they recommended a traditional preventative measure of drinking a tablespoon of kerosene with a little orange juice. We of course thought they were joking, and they of course thought we were nuts when we expressed concern about the toxic effect on one's liver. We were repeatedly told how the sand flies didn't like the smell of the kerosene coming through the skin. (We assumed that the orange juice had no effect on the flies--that it only increased the palatability of the kerosene). We decided to stick to our less-noxious, spray-on repellents. Our Milford Sound bus driver urged every one to get out of the bus and fill their water bottles with the mountain stream water, though we declined. Giardia is present in parts of New Zealand and the water taps at the public facilities down the road had big signs posted about boiling the water before drinking. When pressed, the driver was sure the water was tested periodically, but we had no such confidence. Bill finished the New Zealand history book that I had yet to start, and the Kiwi author described the history of conservativism and provincialism in New Zealand and the importance of conformity. Those were all factors in creating New Zealand's "brain drain" problem for over 100 years. The first New Zealand-born Nobel Prize winner worked for the Jet Propulsion Lab and had been in the US for decades as he couldn't get placed as a school teacher in New Zealand. I remember an Australian woman I knew in Portland who was positively thrilled to be in the US. She was an enthusiastic, PhD level scientist with ambitious research plans and felt that the more laid-back ethic in Australia hampered her professional development. I wondered if that was happening in New Zealand too, if they were continuing to experience a brain-drain because the go-getters didn't fit in. Historically, the few New Zealand cities hadn't been an effective haven for the bright and creative as in many countries. The low employment level also made for an odd twist in New Zealand in that many people were very new at their jobs. I stopped asking grocery store clerks and shelf-stockers about where to look for certain products on the shelves as they never knew. Only if the store was big enough to have a computer and a customer service person to run it could I learn if the store stocked a particular item. I eventually realized that many of the staff probably had only been on the job a few days. Even on our rock climbing outing in Wanaka, our guide who literally held our lives in his hands, had only been in the area a month. He was clearly an accomplished and accountable guide and we felt safe with him, but he wasn't the old-hand in the area that we had expected. His assistant was only going to be there a week and had arrived in town that morning. Apparently the low unemployment allows for an incredible level of job mobility in some industries. We spoke with 2 young British veterinarians who were traveling and working in New Zealand for about 6 months, planning their next job a week or 2 in advance and only working at each place for a few weeks at a time. In the US, you couldn't even get through the employment screening and paperwork process for a professional level job in that length of time. Early in our New Zealand stay I became curious about when the country achieved independence from Britain. I expected to effortlessly bump into that little fact but quickly discovered it was hard to find. Museum timelines of New Zealand's history repeatedly omitted that bit of history. Since the US's break from the motherland was such a to-do and so much a part of our history and myths, I was curious about its absence in New Zealand. None of the written material we had mentioned the date and our New Zealand history book didn't reference the event in the index. Bill finally found the buried story in the history book text. New Zealand 'left home' kicking and screaming. Great Britain had a methodical process by which it gradually granted its various territories and colonies increasing independence, with a final severing act that required each country to ratify the change. New Zealand was the only country that procrastinated for years, unceremoniously making the final break in a pile of other legislation after WWII. Around WWI the Kiwi's began a conscious effort to carve out a separate identity but like a rebellious teenager, it didn't really want to give up the comforts that would be lost with full independence. Italians were in the second wave of migrants to New Zealand, with the Brit's always being the predominant European settlers. The Italians were significant in the early category of "Others," along with Croatians and Greeks. But outside of one museum, there was little to suggest that New Zealand was anything other than a British colony in the early days. In our own way, we honored the forgotten Italian presence by studying the Italian language as we traveled around the 2 islands. It wasn't really planned that way but Bill had loaded up on Italian language electronic references, instead of his usual German ones, just in case we got the urge to pursue the language. And the nudge to study Italian provided by the extra resources turned out to be a perfect fit with our needs. We generally found New Zealand to be a little too "low stim," a little short on things to stimulate our minds as cyclotourists. The scenery was pleasant but only dramatic in some limited areas. And then there were the almost daily rains and bouts of fierce wind early in the trip that stimulated thoughts in us we didn't want to be feeling. So many days, the irksome challenges of conjugating verbs and learning lists of nouns was actually a welcome diversion. Even on the exalted tramps, we found ourselves reviewing relevant Italian words just to add a little needed pizzazz. Though we had a nice Italian DVD course, we quickly diverted to our old favorite format of "Circus Italian" (or Spanish or French) in which we learn the words triggered by our environment. On the bus ride to Milford Sound I spotted a display board discussing the area's avalanche problems. Back on the bus, I was busy on the Italian dictionary within my handheld computer looking up the word for "avalanche" and then came the avalanche of related words like "snow flake," "to snow," and "shovel." That dovetailed nicely with all of the glacier-ice-crampon-crevasse-related words we'd picked up on the glacier a week or 2 earlier. No topic was missed, as we learned dozens of words triggered by any actual or virtual voyage: forests, animals, plants, kitchens, body parts, tools, and the need to make bad jokes all sent us running to our dictionaries for new words. After Bill remembered that TV cooking shows were great programs for beginning language students, he quickly added a 100 culinary words to support that avenue of study when we are in Italy. We did a rough estimate at one point and we'd loosely acquired about 1000 Italian words over the course of about 6 weeks using this reactive approach to learning. One month remains of our 4 month stay in New Zealand and we initially had planned to spend most of it biking north along the east coast of the South Island to meet our ferry at Picton. But we emerged from the Catlins at Balclutha, south of Dunedin, and were instantly thrown back onto 2 lane road that was effectively the north-south expressway for the island. At times, it seemed that every other vehicle was a truck-trailer rig. We immediately began reconsidering our coastal route plan, deciding to abandon the appealing "close-the-loop" approach of biking all the way around the island. Map Man is now back at the drawing board looking for more scenic inland routes to occupy us away from the heavy traffic and we'll take a bus back to Picton when the time comes. We've logged enough hours on the roads with New Zealand's truckers to know that we want to minimize that experience. We have 2 remaining sight-seeing activities that we still plan to do in the coming weeks. 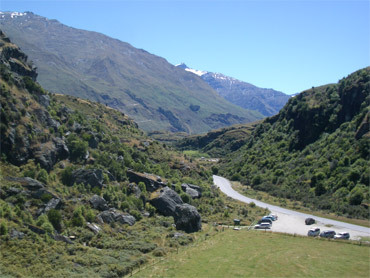 One is to see Mt Cook and the other is to take the scenic train ride from coast-to-coast over the Southern Alps. It's set-up to do as a 1 day, round-trip event, starting from and finishing in Christchurch on the east coast. We've just arrived in Dunedin for our 3 night stay. I'm looking forward to getting a fix at the acclaimed regional museum in town and we plan to do a one-day guided excursion to view an albatross colony and other wildlife on the nearby peninsula. And it is here that Map Man will hatch our new plan for the next month of travel in New Zealand.